I’m excited to introduce myself, Bonny Hartung, the store, and my staff! Once we acquired the Thimbleberries building on November 15, 2012, we did minimal painting since the building was in such great shape, knocked out a wall and tripled the size of the shop. We had our grand opening as Quilt Haven on Main on April 6, 2013. I’ll tell you a little about myself and my husband, Don. We have farmed for 41 years and continue to farm in the Cosmos, MN area. We have 3 married children and 6 “perfect” grandchildren. 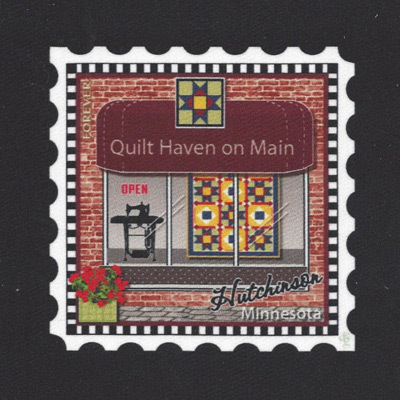 For the previous 10 years I had operated an in-home quilt retreat called “Bonny’s Quilt Haven” in Hutchinson, MN where Don was better known as “Tuxedo Man”. We both hosted over 200 quilting retreats and were privileged to pamper quilters from all over the United States. Now how did we get from there to here? That’s a very good question… It all began on a perfect summer night when we happened to walk by the Thimbleberries Studio Shop on our way to dinner at the pizza restaurant across the street from the Thimbleberries building. We noticed a sign on the sidewalk announcing an “Open House” of the quilt shop building. We already knew Lynette was closing the Studio Shop and that the building was up for sale. I thought Don would like to see the entire building because it’s so amazing. One thing very quickly led to another and here we are; owners of a quilt shop in downtown Hutchinson in a building I have loved since the first time I stepped through the doors years ago. I feel like I’m living in a dream and soon someone will pinch me and I’ll wake up! Honestly, I can hardly believe this beautiful building, quilt shop, and amazing staff are a part of my daily life. I feel very blessed and overwhelmed all at the same time. At the shop you will be greeted by the familiar faces of our experienced staff. Connie continues to manage the quilt shop as she did for Lynette Jensen and Jean Leper for the last 15 years. She is invaluable to me in so many ways, and I would never have gone on this journey without her. Our ‘veteran’ employees include Kim and Marcia along with Trix, Nancy, and Beth. Our youngest employee, Lexi was just 15 years old when she started. She continues to keep things fresh while learning from the more experienced generation. In addition to our on-site staff, we are blessed to have local quilters and long-armers making samples for us on a non-stop basis. Don and I feel incredibly fortunate to have these wonderful women on board with us. Our team always emphasizes camaraderie and teaching. On the first Friday of every month, laughter resonates from the loft, where quilters sew and share stores until almost midnight. There is no charge for this fun, we only ask that you call to reserve a table, as this is a very popular event. 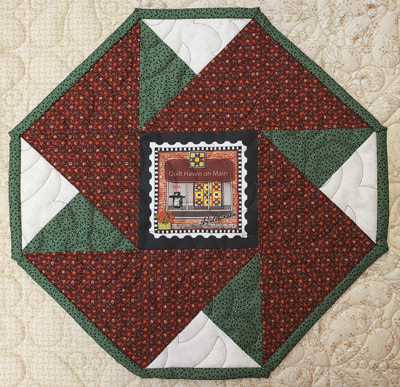 Others partake in classes which cover everything from Beginning Quiltmaking to T-shirt classes, Tuffets, Judy Niemeyer paper piecing, block of the month clubs and embroidery projects. Quilts of Valor, mission, home school and 4-H groups also find quilting purpose here. We always look forward to Shop Hops and other days when out-of-town buses drop by. We kick into high gear helping customers and making new friends. Every bus gets a personal greeting from Bonny & Don who still enjoys meeting new ‘Charm Packs’ of quilters as Tuxedo Man. Our entire staff loves to line up on the sidewalk to greet the buses, especially when we’re decked out in themed-costumes, regardless of what the cars passing by must wonder! We were beyond thrilled when we were selected as American Patchwork and Quilting’s Quilt Sampler magazine’s Top 10 Shop in Spring of 2017. We had fun creating our exclusive Topsy Turvy table runner pattern for the magazine. Our shop is all about ‘Fun and Inspiration’, our mantra that we very much take to heart!